How Much Does it Cost To Fly To La Romana? The cheapest flights to La Romana found within the past 7 days were $272. Prices and availability subject to change. Additional terms may apply. Located in the southeastern corner of the country amid vast sugarcane fields, La Romana is the Dominican Republic's third-largest city. Pristine beaches, world-class diving and golf opportunities, and lively Latin culture and cuisine make La Romana a refreshing tropical vacation destination. The fact that many people aren't familiar with this slice of paradise is precisely why you should look into flights to La Romana International Airport (LRM). La Romana flights deliver you to a nirvana that's exclusive and sought out only by those in the know. In other words, it's the place to go to enjoy a world-class vacation without battling throngs of tourists. Most hotels in La Romana are located 10 minutes or less from the beach and just 20 minutes from the quaint fishing village of Bayahibe, where you'll enjoy kayaking, paddle boarding, diving, and even a submarine ride. At La Romana airport, you can rent a car or hail a cab (though cabs here only accept cash) to get to your hotel. You'll find cabs waiting outside of baggage claim and car rental kiosks within the terminal. Public transportation options from the airport are limited and not always reliable, so it's best to line up alternate means of transportation. Whatever mode of transportation you choose, make sure to visit the 15th-century replica Altos de Chavon village with its quaint restaurants and shops, as well as La Romana's Casa de Campo seaside resort, an internationally renowned golfing destination and a playground for the rich and famous. La Romana is less than a 70-mile drive from Santo Domingo, which makes an exhilarating day trip if you do rent a car. Ready to explore La Romana? You'll find a huge array of cheap flights to La Romana International Airport on Travelocity. Better yet, you'll find cost-effective La Romana vacation packages that bundle both hotel and airfare to save you up to $537. Extra pesos in your pocket means more money to stock up on the Dominican Republic's amazing larimar and amber jewelry. Question : Where can I find cheap flights to La Romana? Answer : We know you’re looking for the best flights at the lowest fares, so we found some of the sweetest deals in town just for you. Check out the top flight deals to La Romana. Act quickly and score yourself a bargain! Spirit Airlines has a flight from to La Romana departing on 4/30/19 and returning on 5/3/19 all for only $281.00 per person. * Book these Spirit Airlines flights! Spirit Airlines has a flight from to La Romana departing on 5/10/19 and returning on 5/14/19 all for only $351.00 per person. * Book these Spirit Airlines flights! Copa has a flight from to La Romana departing on 5/18/19 and returning on 5/21/19 all for only $401.00 per person. * Book these Copa flights! Question : What are the most popular airlines that fly to La Romana? American Airlines Flies 73 flights per week between and La Romana. JetBlue Airways Flies 61 flight per week between and La Romana. Delta Air Lines Flies 46 flights per week between and La Romana. Question : Which hotels are located near airports or major attractions in La Romana? Answer : We've put together a list of hotels in La Romana close to airports and popular sights to see. Check out the hotels below. 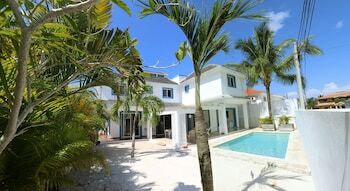 All of them are within proximity to must-see attractions and major airports in and around the city of La Romana. 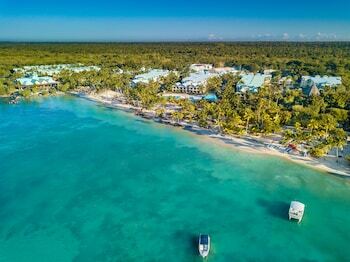 Casa De Campo: This exclusive Dominican Republic resort with its own private beach encompasses 7,000 acres on the island's Caribbean coast in La Romana. 90 holes of Pete Dye-designed golf are on site. This hotel has a 5.00 star rating. Grand Bahia Principe La Romana - All Inclusive: The hotel is located near the cities of La Romana and Altos de Chavon, in the East part of Dominican Republic. 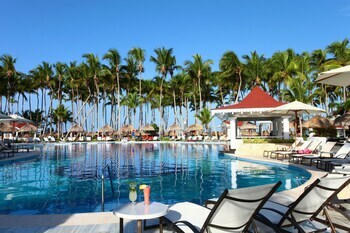 Easily accessible, the resort is 45km from the Santo Domingo airport and 25 from la Romana airport. This hotel has a 3.50 star rating. Los Altos Condo Residences Casa de Campo: This family-friendly La Romana condominium resort is located near the airport, within 1 mi (2 km) of Dye Fore Golf Club and Altos de Chavon Village. The Links and Altos de Chavon Amphitheater are also within 2 mi (3 km). This hotel has a 4.50 star rating. 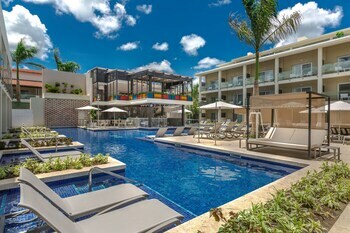 Hotel Karma: Situated near the beach, this hotel is 1 mi (1.6 km) from El Obelisco and 1.4 mi (2.2 km) from La Romana Port. Catalina Island National Park and Teeth of the Dog are also within 6 mi (10 km). This hotel has a 2.50 star rating. Question : What are the top attractions in La Romana? 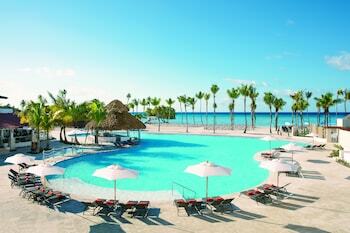 Answer : La Romana has over 12 points of interest for you to choose from. We suggest checking out Teeth of the Dog and Bayahibe Beach first because they are the most popular attractions in La Romana. Don't forget about other highly recommended spots like Altos de Chavon Amphitheater, Catalina Island National Park, and El Obelisco. Get out there and see what the city has to offer on your trip to La Romana!